So here’s the rundown of how the feud started. Donald Trump decides that because he likes golf and has billions of dollars to throw around, he’s going to build a golf course on the coast of the country where golf was born. He starts construction. Scottish authorities realize some years ago that they’ve got approximately one quarter of Europe’s offshore wind energy potential and tapping just a third of what they’ve got could power Scotland seven times over. 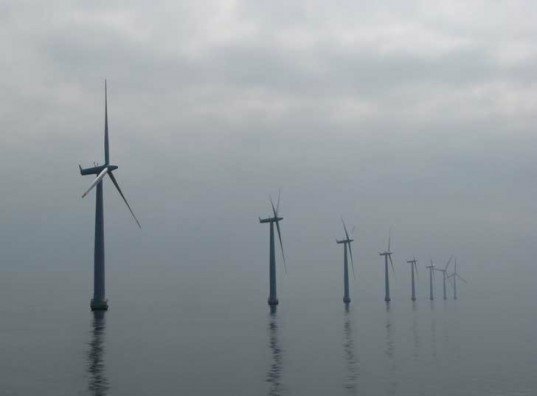 Scotland starts to propose offshore wind turbines. Scottish Liberal Democrats leader Willie Rennie was particularly incensed by Trump’s vitriol for the renewable energy proposals. “What Mr. Trump needs to understand is that Scotland will live up to our responsibilities to tackle climate change,” Rennie said. “This letter is a desperate attempt by a rich man who is used to getting his own way but his tizzy is embarrassing. Instead of the world laughing at Scotland, Scotland is laughing at Mr. Trump.” Scotland’s first minister, Alex Salmond, has described Scotland as the “Saudi Arabia of renewable energy” and seems bent on developing that potential. In an interview post-Trump attack, he said he believed that even the real-estate mogul could be swayed when shown offshore wind energy’s positive potential. The country currently has 62 turbines offshore which produce 200 megawatts of power, and the plan is to develop that by a multitude of 50 to meet 2020 renewable energy goals. Perhaps a better way for the Scottish government to sway Trump would be to show him the destructive environmental impact of the traditional golfing industry — which we’re sure his golf course isn’t going to do much to try to diminish — and perhaps to plaster his lovely rolling greens with giant photos of mountaintop coal mining and offshore oil spills. What people like Trump forget is that our lovely little offshore wind turbines — and they are lovely, aren’t they? — are helping us to move away from some truly abhorrent forms of energy that are not only unsustainable but seriously ugly as well. Trump justified the destruction of a Site of Special Scientific Interest, and the departure from the Structure Plan (which was to leave the area as undeveloped coast) on the grounds that the economy needed to diversify as the oil runs out. If the oil is running out (it is not) the area will need other sources of energy, and find other applications for the expertise in offshore structural engineering that the area has developed. msyin -- Askernish is a low energy, low impact golf course (though getting there is not low energy). How embarrassing. Well, we aren't all like The Donald. The world doesn't really need another green dessert golf course and as pointed out, he was not building a sustainably low impact world class course (which would have been a first) and apparently not much of a clue as the the true meaning of what is truly damaging to an environment. He is not alone in his views but the Scots obviously have a far reaching plan that I hope they will see through. You can imagine now what we have to go through here in the USA to get things like this done if he is behaving like this. Good on you Scotland. Donald Trump may be a real estate mogul with an estimated worth of who knows how many billions -- we think it might be seven -- and a penchant for trying to derail presidential campaigns but that's not stopping Scottish authorities from standing up for themselves in the face of this combed-over bully. Trump started a nasty feud with the nation when they announced plans to erect a series of windmills in Aberdeen Bay near Trump's new luxury golf resort in Aberdeenshire. The Don threw a tantrum, wrote a personal letter to Scotland's first minister, Alex Salmond, shut down construction on the golf course and said he wouldn't start building again until Scottish authorities promised not to erect those "ugly monstrosities". Now the Scottish government is fighting back calling his tantrum "embarrassing" and assuring the world they won't be "bullied by Mr. Trump and his millions."